A value stream is the series of activities (the how) creating a flow of value (realizing the value [product/service] that the customer gets). 'Value' is what the customer gets, like a product or a service of high quality, in a fair period of time at a fair price. Value streams are a proven effective way of looking at the business processes in your organization, or rather looking at the flow of value without being distracted by current business process boundaries. While it's originating in manufacturing, value streams are now widely used for modeling, and understanding business processes. However, value streams are not equal to business processes. Often a value stream encloses (parts of) business processes. The business process and business services often form the starting point for discovering and understanding value streams. Value streams relate to case management pathways, but do not equal them. To prevent chaos in the planning and implementation of a process, often a value stream map is created, which shows where in activities, time, cost and quality are provided or consumed. 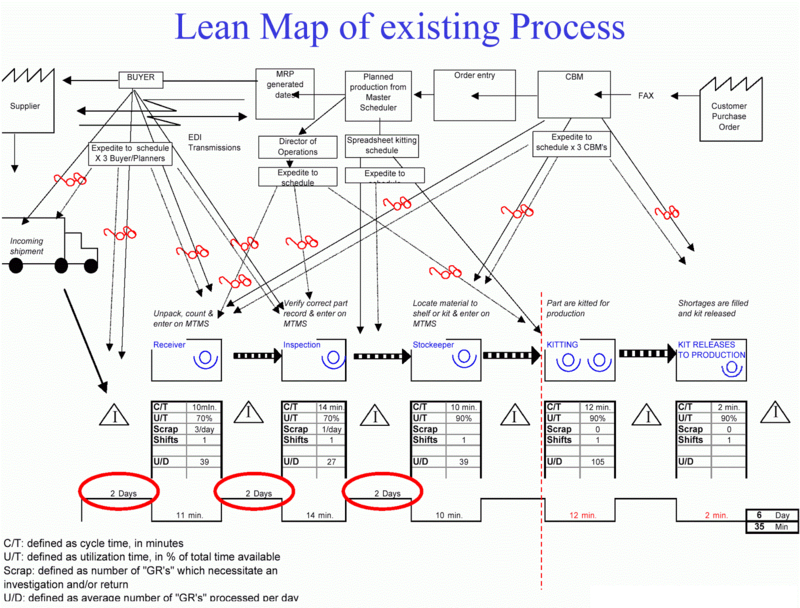 In LEAN, Value Stream Mapping is a method for analyzing the current state, and designing a future state for the series of events that takes a product or service from its beginning through to the customer. Six Sigma is a data-driven approach for eliminating defects in processes. The goal is driving towards six standard deviations between the mean and the nearest specification limit. The scope of six sigma is from manufacturing to transactional, and from product to service. More and more often the strength of LEAN and Six Sigma is combined to reach great results by eliminating eight types of waste in processes. A value stream map shows how value (like product or service, including all of its attributes) is flowing through your company or chain of companies from beginning to end. Looking at the value stream via a map, we can repair leaks in quality, time and price. Where business processes increase alignment of activities, understanding value streams helps to optimize creating value (not losing time, money and quality). The Dragon1 platform supports value stream mapping. All the basic symbols for creating a value stream map are present. You can extend the icon set with your own shapes.